OXFORD, Alabama -- The #1 Pinson Vallay Indians scored a late touchdown by quarterback Bo Nix to pull away with a 28-13 Class 6A, Region 6 win over Oxford at Lamar Field Friday night. Early in the fourth quarter, Oxford cut the Pinson Valley lead to one score but the Pinson Valley offense pulled away for a two score game with only five minutes left in the game. Pinson Valley (4-1, 3-0) was the first team this season to score over two touchdowns against the solid Oxford defense that only gave up six points coming into this big matchup. "This was a good win for our football team," said Indians head coach Patrick Nix. "To come into this place and win against a very good football team here, it is a good win. Both defenses played well and we knew that they had a good defense. Very thankful to get this win in a hostile environment against a very good football team." Pinson Valley scored first in the game when Nix hit GaQuincy McKinstry on a 4-yard touchdown pass for the Indians. With the score late in the first quarter, Pinson Valley led 7-0. On the next possession, the Indians forced a Yellow Jackets punt and on a bad snap the punter went to his knee deep into Oxford territory. Four plays later though, the Yellow Jackets forced four incomplete passes from the 5-yard line of Oxford to turn away a Pinson Valley scoring opportunity. After the Yellow Jackets defensive stand, Oxford marched 95-yards and Jonovan Carlisle scored on a 5-yard touchdown run with 11:27 left in the second quarter to tie the game at 7-7. 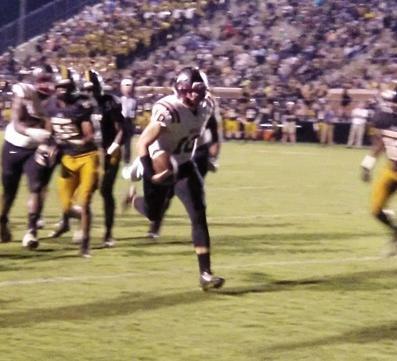 With 5:52 left in the second quarter, Pinson Valley scored again on a Jay Sharp 11-yard touchdown run. With the touchdown, Pinson Valley led 14-7 late in the first half. The Pinson Valley defense forced a punt late in the second quarter and the Indians with :58 seconds till halftime, scored on a Nix to Keyonteze Johnson 52-yard touchdown play and that game Pinson Valley a 21-7 halftime lead. Both teams struggled to get anything in the third quarter, but with 7:52 left in the game, Trey Higgins scored on a 10-yard touchdown run to cut the Pinson Valley lead to 21-13. The extra point was missed but Oxford cut the deficit to one score. With 5:04 left in the game, Nix scored on a 4-yard touchdown run to seal the win for the Indians as the Pinson Valley defense was stingy most of the night against the Yellow Jackets offense. Kendall Thornton picked off a late Yellow Jackets pass to seal the win for Pinson Valley. The Pinson Valley defense held Oxford to 200 yards of total offense on the night and needed to get more out of their passing game for a chance to win tonight but that didn't happen. For Oxford, Ty Smith-Lindsey had 115 yards on 22 carries on the night. Higgins completed only 6-of-14 passes for 49 yard and the Oxford offense needed more balance but couldn't get it tonight. For Pinson Valley, Nix completed 10-of-26 passing for 175 yards and two touchdowns with 45 yards on three carries and a touchdown. Sharp had 85 yards on 19 carries on the night while Johnson had four receptions for 122 yards. Linebacker Antonio Williams had eight tackles in the game for the Indians. Up next, both teams have open weeks and will take off next week for some much needed rest.